I found what I had and I believe it is DVD Profiler...but I can't figure out how to enter in new titles now. I'm so hopelessly behind anyway that it's probably best that I just forget about it. I don't feel the need to keep an online diary of everything I have. Let's move on. Support Your Local Sheriff (1968) Directed by Burt Kennedy. Burt Kennedy directed a number of westerns and quite a few of them seemed to have a fair amount of humor. This one, released in 1968, may just be his funniest, an outright comedy (but not anywhere as outrageous as Blazing Saddles). James Garner heads an all-star cast including Joan Hackett, Walter Brennan, Harry Morgan, Jack Elam, Henry Jones and Bruce Dern. 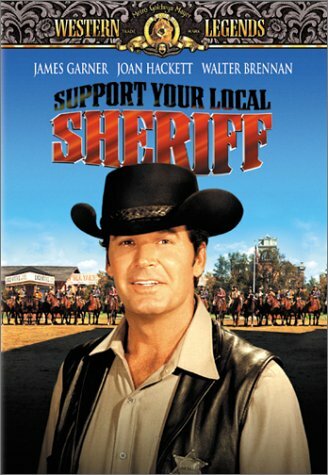 The basic setup has loner James Garner coming into a gold-mining town which has one problem...The Danbys, a mean family headed by Walter Brennan who always lean on the locals for a share of their gold. They've had 3 sheriffs in the last two months and when Garner's character takes the job, most figure he'll be yet another very temporary lawman. The new lawman's first job is to arrest one of the Danby boys (Bruce Dern) he earlier saw kill a man in the saloon. Only problem there is that the new jail hasn't gotten it's bars yet. Then old man Danby (Brennan) comes in and pulls a gun on the sheriff...who promptly sticks his finger in the pistol barrel! "If I'd have fired, the gun would have blown up right in my face!" "Well, it wouldn't have done my finger any good either, would it?" There's a lot of funny stuff in this movie and you owe it to yourself to check it out if you haven't seen it yet. Jack Elam is especially good as the gruff deputy who doesn't particularly want the job...it's my favorite performance by Elam. Interestingly, there was a follow-up movie titled "Support Your Local Gunfighter" released 3 years after this one. Despite the nearly identical title and much of the same cast, it isn't a sequel but another comedy western using the same tongue-in-cheek humor. That one did replace Joan Hackett with a different leading lady (Suzanne Pleshette) and also added Chuck Connors as a famous gunslinger. Not much in the way of extras are included in this DVD...just the theatrical trailer. Perhaps we'll get a special edition released someday. Another one that sounds good! It is...but I've actually only come across a few westerns I really disliked...mainly Forty Guns and Young Guns...probably a couple others if I sat and thought about it. My mom and stepdad have Support Your Local Gunfighter..I got it for them for Christmas last year or the year before. I'll have to remember to look for this one for them. I've had this movie a long time...I'm not sure if it's even still available. Hopefully you'll find it somewhere. An authoritarian rancher, Barbara Stanwyck, who rules an Arizona county with her private posse of hired guns. When a new marshall arrives to set things straight, the cattle queen finds herself falling, brutally for the avowedly non-violent lawman. Both have itchy-fingered brothers. That's the gist of this unusual western. The storyline is almost hard to understand and you sometimes get lost in the plot. At first, Barbara Stanwyck's character seems like pure evil and then you start to see her gain a few soft touches here and there. The photography is unusual...weird close-ups (we see a woman through the barrel of a rifle, making me wonder if that's where they got the idea for the James Bond opening), much of the action seems to be shot from cameras about a foot off the ground. There is some nice stunt work in here, including a scene where Miss Stanwyck falls off her horse but, her foot stuck in a stirrup, gets dragged a fair peace in what looked like a very dangerous stunt. Was it really her and not a stuntwoman? It sure looked like her. Unfortunately, the movie is so stylized that it doesn't really seem to have any heart. I found myself not really caring about any of the characters. It was pretty short at 79 minutes which was probably just as well...much longer and I might've gotten a bit bored. I did like the ending which was a bit different. Usually, the hero leaves town alone and that was happening here...but then Miss Stanwyck races after the buckboard the hero is driving and they leave town together. Oh yes, Hank Worden is in this movie, too. I really enjoy this character actor...unfortunately, he departs the storyline pretty early. As far as the DVD goes, it is two-sided. One side is full-framed while the other side has a widescreen presentation in its proper 2.35: 1 aspect ratio. It has no real extras, apart from the theatrical trailer. There is an error on the DVD case, by the way. It states the movie is in color but it is actually is in black & white. One of these days you will review one I actually seen! Of course that could take a while as many as you have and as little as I have seen! 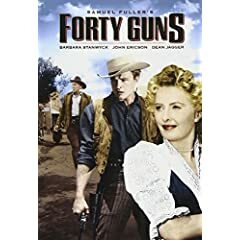 Well, Pete, you'll get to see Forty Guns soon as it's coming soon in my package to you so get ready! I could review Rio Bravo, of course...but I wonder if I should since I know you've already reviewed that one yourself! Funny. I recently commented on that title in reply to addicted2dvd's "care package" post. It is one of my favorite westerns (others being McCabe and Mrs. Miller, The Assassination of Jesse James by the Coward Robert Ford and the HBO show Deadwood). I have not seen the other three you mention though I do have a copy of McCabe and Mrs. Miller...I just haven't watched that one yet. Looking forward to it Roger! And Rio Lobo (another Hawks) has similarities. Then chuck Assault on Precinct 13 in which was based on it!